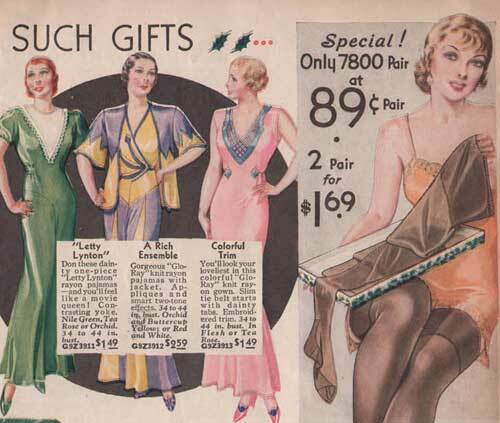 We take a quick peek at their underwear and hosiery selection from 1933. Every American woman knows the importance in maintaining her figure. With good shape-wear, your wardrobe immediately looks better on you. Now from Sears comes a new range in comfortable corsets– NU-BACK, which is everything a foundation should be. It gives you extra inches when you stretch, yet maintains a feminine youthful figure. Our garments never ride out of place, never crowds at the diaphragm. 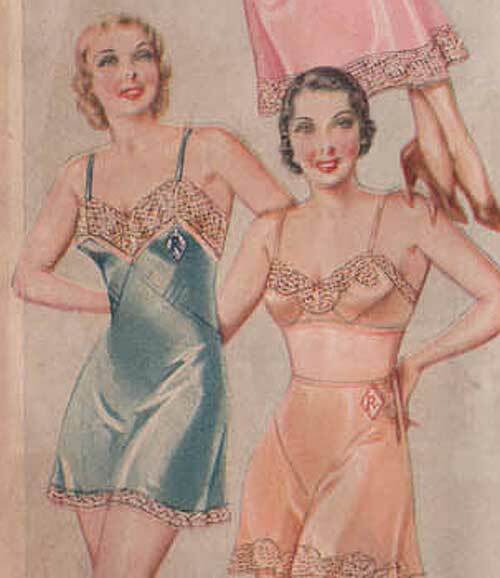 No strain on garters – which saves on stockings, and no gapping of shoulder straps. 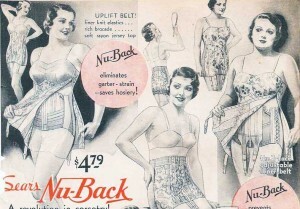 Feel more womanly this Christmas with NU-BACK corsets from Sears ! your embroidered initial. Shaped bandeau to match! In Pajamas – why not don the Letty Lynton one piece ( far left) – made from silky rayon, you’ll feel like a movie Queen. Next there’s the gorgeous Glo-Ray knit rayon pajamas with jacket and thirdly, you’ll look your loveliest in this colorful Glo-Ray knit rayon gown! For the sheer laciness of a cobweb and the glow of lovely pewter, slip into these silky stockings in a glamorous new Metal Mist color, with french heel and re-enforced toe. strong enough to wear to work and sheer enough to wear in evenings. Finally in hosiery, you’ll have to grab these mouth watering fine guage stockings for Christmas, with style details that make them the number one Sears selling stockings. 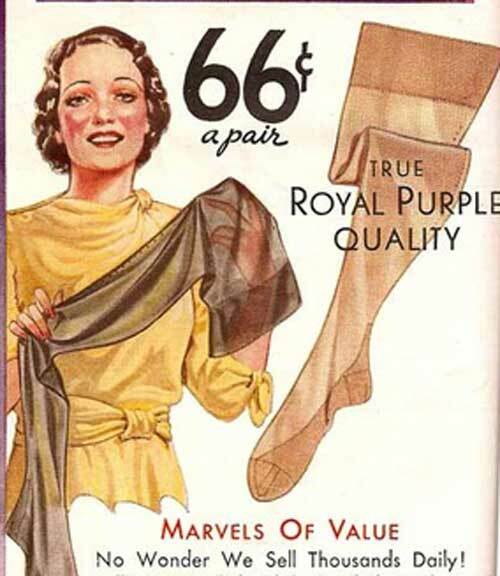 Full fashioned, dull silk, they feel so smooth to wear and are so affordable at just 66c a pair!